Visual COBOL for Eclipse R4 is GA today! JVM COBOL samples are included with the product. If running on Windows there is a SamplesBrowser, which you can access from the Start Menu. The samples are installed in subfolders under C:\Users\Public\Documents\Micro Focus\Visual COBOL 2010\Samples. Note: On older versions of Windows the samples might be installed in a different folder, such as for Windows XP, C:\Documents and Settings\All Users\Documents\Micro Focus\Visual COBOL 2010\Samples. Click Start menu > All Programs > Micro Focus Visual COBOL 2010 > Visual COBOL Samples. 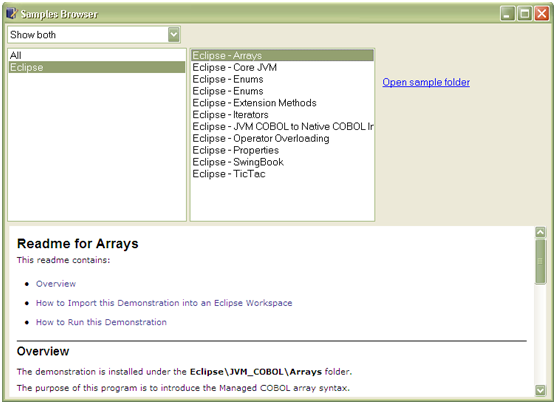 Follow the instructions in the “How to Import this Demonstration into an Eclipse Workspace”. 3. Then follow the instructions in “How to Run this Demonstration”. The samples are in a .jar file that needs to be imported into your workspace. Choose General > Existing Projects into Workspace and click Next. Choose Select archive file and browse to <install_path>/Micro Focus/Visual COBOL 2010/eclipse and double-click samples.jar. 4. Select the samples you want from the list and click Finish. This loads the selected projects into your workspace. You will see that the project is compiled and runs.